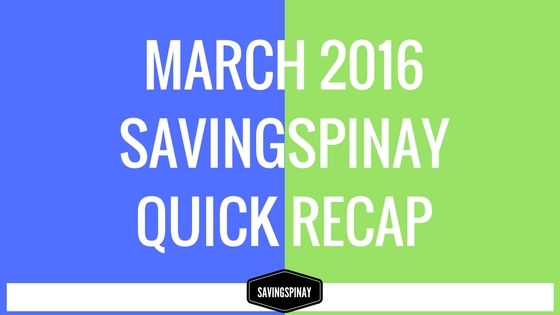 Things are becoming better for SavingsPinay in terms of posts. Yes I know it is half the goal of 20-22 posts a month but at least it is an improvement compared to February. There are also highlights for March that I am excited to share. Let’s start. We surpassed our goal for March to reach 115,000 pageviws on SavingsPinay. Yehey!!! Now for April I will be trying to reach 120,000 pageviews and successfully publish at least 20 articles. I received an email from Ms. Nella of Coffee Bean and Tea Leaf that they will be doing a community feature on Brew Your Best Year website. With this they will be highlight the most active contributing artists/writers and share their stories to the website. I answer a bunch of questions and excited for when it will be published. I have about 5-6 contribution to Brew Your Best Year website under Career and Finance category click HERE to read.